Nasal tip shape is largely determined by the shape and integrity of the LLC (lower lateral cartilage). The tip surface is divided into the dome, alae, soft triangles, and columella. The major tip support mechanisms include the size, shape and integrity of the LLC, the attachment of the medial crus to the septal cartilage, and the attachment of the LLC to the ULC (upper lateral cartilage). The minor support mechanisms are the interdomal ligament, dorsal portion of anterior septal angle, sesamoid cartilages, the LLC attachment to skin/soft tissue, and the nasal spine. Nasal Profile Projection Minas Constantinides M.D. and Michael Carron M.D. Although nasal tip rotation is not purely a profile adjustment, it is most easily scrutinized from the profile view. Simons describes rotation of the nasal tip as an arc with the radius maintained. [See fig.23-6 Male b/a] As the tip is rotated, there is some illusion of increased projection although none exists. Tip rotation is defined as the tip angle from the vertical alar crease to the tip. In women, this angle is approximately 105 degrees and in men 100 degrees. 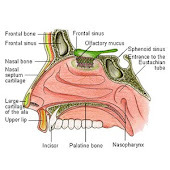 The degree of rotation may be affected by the intrinsic properties of the nasal tip (lower lateral cartilages) or external properties (caudal septum). The position of the nasal tip determines the caudal endpoint of the nose, establishing with the radix nasal length. Changing the projection and rotation of the tip directly affects nasal length. Anderson's tripod principle is most helpful not only in evaluating each tip's unique position but also in guiding what changes will affect tip positon postoperatively. Every step in tip-plasty will somehow affect nasal length, projection, and rotation. Instead of directly altering the cartilages of the lobule, other more indirect methods to affect relative alar cartilage position include lateral crural overlay or medial crural feet division. These techniques leave the dome area unaffected, whereas affecting the tripod laterally (lateral crural hinge areas) or medially at the feet of the medial crura. A combination of these techniques can create fine changes to tip rotation and nasal length, whereas always decreasing tip projection. If the surgical goal is to increase tip projection, then either lateral or medial alar cartilages must be recruited into the lobule area, or onlay cartilage grafts must be added. Lateral or medial crural steal techniques, stabilized by cartilage struts or septal extension grafts, achieve small increases in tip projection. Tip grafts can add substantially more projection, if needed. Many expert surgeons now routinely implant small rim grafts at the conclusion of most of their rhinoplasty's to stiffen the alar rim and counteract any tendency for retraction. Occasionally, significant retraction in the revision case will require composite skin-cartilage grafts from the ear to fill the tissue void and scar contracture, especially when it involves the soft tissue triangle. In cases of Hanging ala, rotation changes of the lobule will always improve this subtle deformity. The junction of the columella and lip creates the nasolabial angle; changing its anatomic components can subtlety improve the final rhinoplasty result, uncovering the lip and improving the smile. The inferior caudal septum and nasal spine comprise the rigid framework for the top of the upper lip. Typically, prominence in this region will increase the nasolabial angle and, of greater esthetic consequence, make the upper lip look pulled up by the nose. Deepening the nasolabial angle by removing inferior cartilage or bone will improve this appearance but may also increase the apparent length of the upper lip. If the nasal depressor muscles are widely detached during this maneuver, the upper lip may also drop, hiding the upper teeth more during smiling. In cases where the smile is already too "gummy" with too much gingival show, this can be a significant improvement. However, if the upper teeth are already slightly hidden with the preoperative smile, then any muscle detachment should be avoided in this area. Too acute a nasolabial angle may arise from a deficient premaxilla or too aggressive caudal septal shortening. A premaxillary onlay cartilage graft will help to fill this deficit. Typically, temporary suture fixation of this free graft to the overlying lip helps to keep it in place during the early recovery period. Columellar position is the second component of the nasolabial angle. It may be hanging or hidden. Hanging. A hanging columella is typically seen in two scenarios: either the caudal septum is long, as in a tension nose, or the septocolumellar attachements have been weakened by previous full transfixion rhinoplasty. When the septum is long, shortening it must be accompanied by elevating and reinforcing the medial crura, typically with a strut or tongue-in-groove technique. If the hanging is severe, then a small fusiform excision of membranous columella may also be required. If the septum has been shortened, and the medial crura left unsupported by previous surgery, then re-support with a strut and/or septal extension graft, often with membranous columella excision, will be required. Hidden A hidden columella is typically a postoperative problem, often from over-shortening of the caudal septum or too aggressive a tongue-in-groove technique. A plumping graft that is placed caudal to the medial crura will help to avoid this problem. If unrecognized during an open rhinoplasty, the unsupported open scar will contract during healing, leaving a deficit that will be difficult to correct post-operatively.